FC’12 style is a kit style project of FM Slovakia. This league pack contains 52 real kits; home and away for all clubs in this style. It is intended for use with FM 2018, but it will work with all versions of the game from FM 2009 onward. You’re satisfied with our work and thinking about to donate a small amount? Your donation is more than welcome to guarantee the future of this project. Please do it trough the Donation page in the menu. Thank you. 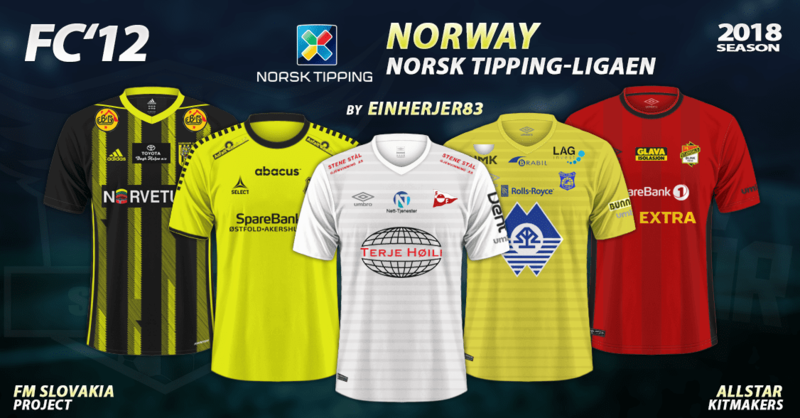 People who want to put Norway – Norsk Tipping-ligaen 2018 kits on other sites, you may link back to this very page but you cannot host any files yourselves. Thank you! FMSlovakia.com doesn’t have a lucrative goal and just want to help the Football Manager community. However, given the amount of work, we would not mind getting some recognition, so thanks you in advance for respecting those rules. This creative belongs its owner, to the site of FM Slovakia.com. It’s in self-service but for personal use only. The only authorized download links are the links on the official site or the sites with the author’s permission.